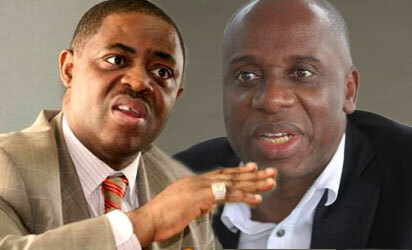 Chief Femi Fani-Kayode and the aide to governor of Ekiti state, Mr Lere Olayinka has reacted to the Minister of Transportation, Mr Rotimi Amaechi’s threaten to sue them for post on their twitter accounts linking him with the $430 million found in a luxury home in Ikoyi lagos state. The Minister through his counsel, Mr Lateef Fagbemi SAN said if they failed to make the retraction of the post on their twitter accounts within seven days they would meet in court. He said the retraction should be made in about five national newspapers and their twitter pages. He also said Olayinka should pay him 500 million naira while Kayode who was a former Minister of Transportation should part with 750 million naira. The Minister said the money were compensation for the damages he had suffered from their various postings. According to Amaechi he was not the owner of the luxury apartment and the money found in the place, adding that he also did not acquire an apartment in the place for a lady and does not own a house in Lagos state. Amaechi who is also a former governor of Rivers state said the post painted him as an adulterous man whereas he is a happy family man, married to only one wife. “In the spirit of a second chance we have our clients instruction to give you an ultimatum of 7 days from receipt of this letter to issue an apology in 5 national dailies and your twitter ha due . Your apology which should be heartfelt must be a total withdrawal of your claim and its imputation must also contain an expression of deep regret for this unwarranted attack and must also contain retraction of the false statement of yours. We also demand from you as compensation for the malicious and defamatory claim. Please note that the demand will increase with time if you fail to retract the statement immediately. Failure to do any of these would be met with stiff legal actions which your defamatory act deserves.”,the counsel said. No losing sleep over suit, says Fani-Kayode Reacting, Fani-Kayode in a statement by his Special Adviser on Media, Jude Ndukwe, said: “We have been inundated with calls concerning about a threat by Rotimi Amaechi to sue Chief Fani-Kayode for defamation over the $43 million issue. ‘’We are not in any sleep over this matter. I’m not aware of any suit — Olayinka Reacting to Amaechi’s suit, Special Assistant to Ekiti State Governor on Public Communications and New Media, Lere Olayinka, said he was not aware of any suit originating from Mr Amaechi.